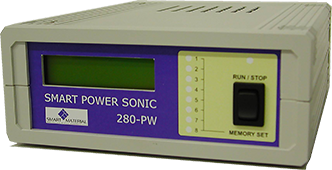 The PowerSonic model 280PW enables customers to drive ultrasonic transducers or similar piezo electric devices with high capacitive loads. 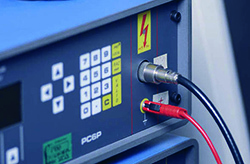 The µC controlled model 280PW generates square pulses with voltages of up ± 280V and frequencies of up to 100 KHz. Typical parameters such as frequency, pulse number, refresh rate, uni-/bipolar operation mode, and shut-down time can be programmed via the RS 232 serial interface. 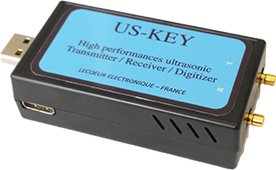 The US-Key is a new generation and one of the world's smallest single channel ultrasound devices. Its format makes it a constant companion especially for mobile and field applications, and for presenting R&D results and prototypes during road shows. 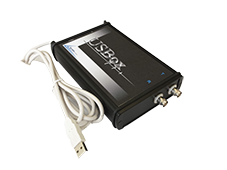 The device provides flexible, powerful pulsing and receiver specs completely powered by an USB-2.0 connection. It is a perfect tool for NDT, academic, and medical applications. The US-Box is the larger version of the US-Key. It is a single channel ultrasound system specifically designed for the needs of commercial NDT applications in harsh industrial environments, but can be used for scientific and medical research as well. Due to its bigger size, several modifications, like transmit voltage level or low frequency cut-off, are possible upon customer request. Its flexible firmware can be adapted to the specific needs of your application. Customers can either use the delivered NDT software or create a tailored GUI using one of the provided software interfaces. 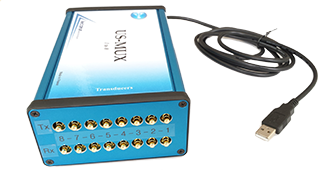 Combine the excellent properties of the US-Key electronics with a fast switching multiplexer and you get our US-Mux. It is an attractive solution if you need to monitor up to 16 different spots using ultrasound with only one device. Several different software interfaces are included, which enable the user to define his own acquisition and measurement GUI.